We have listed top interior design schools and universities across India. Are you looking for the top interior design schools in India? You can take a look at the 2018 highly rated interior design schools and institute, which offer full-time, part-time and weekend courses for design enthusiasts. Best Indian interior design colleges require students to complete 10 + 2 years for undergraduate courses, however if you have two year diploma course in engineering that is acceptable by most institutes. 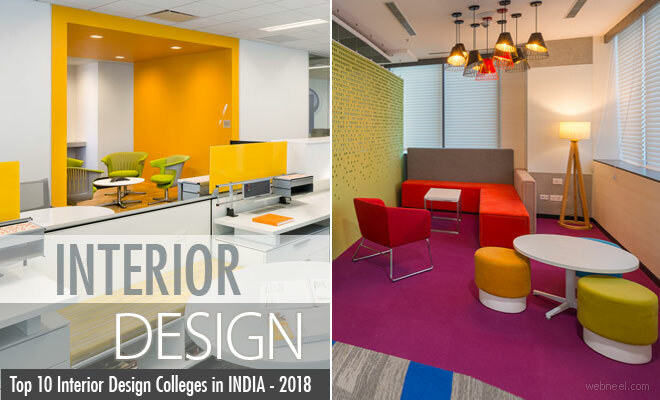 You can check out the top indian interior design schools we have put together and can take an informed decision regarding your design career. About College : The National Institute of Design is a design school in Ahmedabad, India. About School : Sir J. J. School of Art was founded in March 1857 with the generous donation offered by Sir Jamshedji Jeejeebhoy, the first Baronet. Sir J.J. School of Art is one of the pioneering institutes of fine art education in India, since its establishment in 1878 in the current Campus, with generous donation of Jamshetji Jijibhoy, under the British administration. The School today stands in the heritage building with departments of drawing and painting, sculpture and modelling, mural, portraiture, print making, arts and craftes including ceramics, interior decoration, metal work and textiles; and teachers training with art teachers’ diploma, Art Masters and Diploma in Painting Education. About Institute : Established in 1958, the second of its kind, IIT Bombay was the first to be set up with foreign assistance. The institute is recognised worldwide as a leader in the field of engineering education and research. Reputed for the outstanding calibre of students graduating from its undergraduate and postgraduate programmes, the institute attracts the best students from the country for its bachelor's, master's and doctoral programmes. Research and academic programmes at IIT Bombay are driven by an outstanding faculty, many of whom are reputed for their research contributions internationally. About Institute : Interior designing is the most upcoming profession which not only satisfies the aesthetic and creative urge but brings monetary gains as well. This course along with the development of the creative skills involves the knowledge of technical details of application. To achieve best result in the form of appealing. Economically and efficiently designed interior spaces (houses, offices, public spaces etc.) designed by the student. About College : To engage the natural potential of an individual through Design Education & Empower them to Evolve, through the spirit for wholistic Co-creation, enabled by positive thought & action. About Institute : IILM University gives its students the flexibilty to carve their own path by choosing their specialisations after exploring various disciplines. This freedom to make informed decisions puts them on an accelerated path to achieve their goals.The school focuses on going beyond aesthetics and technical expertise helping students to design, create and inspire. About College : We spend the majority portion of our lives indoors – in the interior spaces created by the structures and shells of buildings. Interior Design goes beyond the architectural definitions of space. Interior designing is the planning, layout and design of interior spaces within buildings. The purpose of interior designing is the functional improvement, aesthetic enrichment and psychological enhancement of interior spaces. About College : "Design is not just what it looks like and feels like. Design is how it works" - Steve Jobs, Good design is like a good proverb. It survives generations and is important because it is useful. No one praises proverbs for the reasons they are poetry. Students at the threshold of design education consciously elect o discern between aesthetic and unsightly, often confusing design with decoration. Art is created to please, to extract emotions perhaps and to make a point. A luxury, a pursuit for creative minds,arresting and much more. Art is open to view points and therefore more democratic, such that it allows everyone an interpretation. About Institute : Vogue Institute of Fashion Technology’s new campus is an architecture and design marvel, built with state-of-the art post-modern amenities. It is located in the elite Apparel Park, a revered and prime project of Karnataka Government, housing approximately around 75 textile and apparel giants. The institution provides industry exposure, along with technical and practical field knowledge with assured placements. About Institute : Institute of Indian Interior Designers, popularly called I.I.I.D; was founded in 1972 to establish good professional & trade practices and ethics amongst its members and to highlight and enhance the image of the Interior Design Profession and exchange know-how with similar organizations within the country & abroad. IIID is a member of APSDA : Asia Pacific Space Designers Alliance.